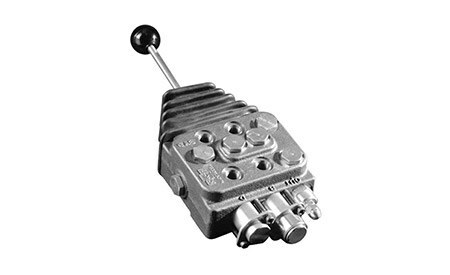 The Cross DV series directional control hydraulic valve, designed for loaders, offers extremely low leakage with outstanding load-holding capability in a compact, space saving model. All ports come out the same surface of the valve and it will fit in a space less than 6 inches wide. Float and regen capabilities, load checks, built-in power beyond and single handle actuator (or standard handles) make this valve ideally suited for the mobile hydraulic loader market. Single handle actuator assembly (with rubber boot or standard handles).